No matter how much I, or others, write about versatility; about the sensible purchases of high-quality multi-purpose garments, do not let it fool you into believing that each and every garment has to be one of year long utility. The ‘special’ garments are often the most fun to purchase and indeed wear and they are often items that you confine to a specific season, or a particular event. They are gratifying items to own, largely because they make the gentleman’s wardrobe more complete; many men would contend they could ‘do’ without owning tails or a top hat, but should the space and the budget allow, the very fact of ownership is immensely satisfying. There is a strangely indulgent and addictive luxuriance in being prepared for every occasion, however remote. Henley Regatta comes but once a year. It lasts for a few summer weeks, although the weather in those weeks is notoriously unreliable; one friend told me when he dreamt of his getting drenched at the Regatta, he had ‘fantasised more of champagne than acid rain.’ It’s rowdy too. What was once a potentially boisterous but scarcely threatening social occasion has recently turned into a succession of dangerous routs; the last Saturday fireworks have had to be banned from this year’s events due to the ‘drunken…behaviour, culminating last year with the stabbing of one of [the] competitors on Regatta land.’ The probability is that I won’t be attending this year – a lack of fireworks and the boorish manners of socially inept heavies who always manage to invite themselves to events at which they have no purpose, place or welcome make for a dismal combination. However, I can still keep the spirit of Henley alive. I recently purchased an inexpensive mock-boating blazer; creamy white with blue piping. It’s uncrested (unless you have a club affiliation, regiment or family crest don’t bother), simple and perfectly suited for one thing, and one thing alone: a sunny summer’s day. Considering my residence in England, this whittles down the probability of wear even further. However, despite my eagerness to wear it and consequent disappointment in being unable to, I am glad of ownership of such a singularly impractical jacket. I generally have no qualms about adopting many of my sporting or country looks into metropolitan wear but this jacket is very much an oddity. However, it will be a grand day when it is finally called into action. For the more boaty and sporty of you, there will surely be further occasions for wear. Nautical naughtiness in the summertime, drinks on the dock, tennis on the lawn, not to mention the odd yacht party. 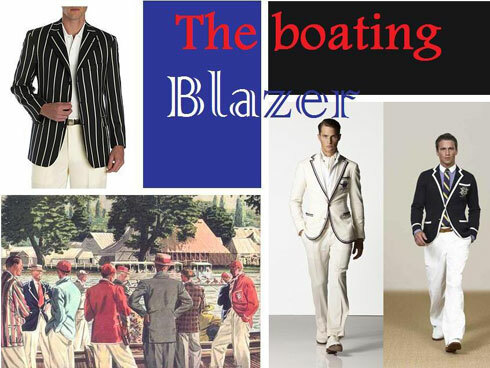 The problem, it seems to me, is that boating blazers are frequently badly fitting and rather bulky. They can look boxy and overly long because of their garishness and are often paired with inappropriate trousers and shirts and accessories. In the picture, the model in the blue jacket is wearing the jacket correctly but the trousers, in my view, look far too full; this has the effect of making the jacket look shrunken when in actual fact, its boyish size is altogether appealing. The model in the white jacket is wearing trousers that are more appropriately slim. I would favour a much thinner trouser, with a slightly shorter leg to accentuate the schoolboy charm of such a garment. The blue blazer with the white edges in the picture, any details on its maker/place of purchase? Ralph Lauren, a summer collection from a few years ago. where did you get the blue and white boating blazer? H&M. I changed the buttons – from a blue plastic to shiny brass. New and Lingwood make some good boating blazers, House of Fraser recently had a blue and white version in their sale, not sure if they have any left though.